1 NodeJS This is the base platform needed to create Mobile Apps using Ionic. You can find detail on NodeJS installation in ourNodeJS Environment Setup. Make sure you also install npm while installing NodeJs. 2 Android SDK If you are going to work on Windows platform and developing your apps for Android platform then you should have Android SDK setup on your machine. Here is the detail on Android Environment Setup. 3 XCode If you are going to work on Mac platform and developing your apps for iOS platform then you should have xCode setup on your machine. Here is the detail on iOS Environment Setup. 4 Coradova and Ionic These are the main SDKs which is needed to start working with Ionic. This chapter explains how to setup Ionic in simple step assuming you already have required setup as explained in above steps. This command will change working directory. Our app will be created on Desktop. Ionic Start command will create folder named myApp and setup Ionic files and folders. Now we want to access myApp folder that we just created. This is our root folder. Next let's build our app. If you have building errors after running following command you probably didn't install android SDK and its dependencies. Head on to our android tutorial and follow the steps shown there. If you want to start from scratch you can install Ionic blank template. We will use the same steps we explained above with the addition of ionic start myApp blank instead of ionic start myApp tabs. Let's add Cordova project for android Platform and install basic cordova plugins as explained above. This will produce below result which is an Ionic Blank App. Third template that you can use is side menu template. The steps are the same as the previous two templates, we will just addsidemenu when starting our app. This will produce below result which is an Ionic Side Menu App. The above command will open your app in web browser. 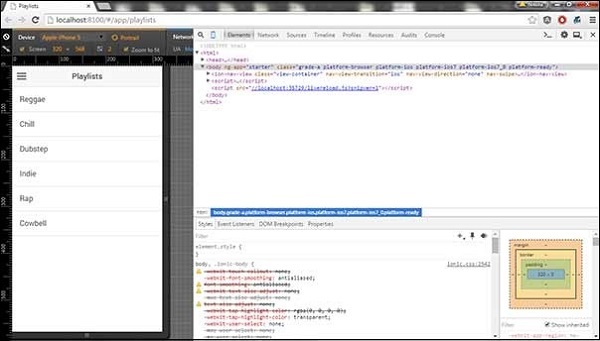 Google chrome provides device mode functionality for mobile development testing. Press F12 to access developer console. The top left corner of the console window click has "Toggle device mode" icon. Next you need to click "Dock to right" icon in top right corner. Refresh the page and you should be ready for testing on web browser. Hooks are scripts that can be triggered during build process. They are usualy used for Cordova commands customisation and for building automated processes. We will not use this folder during this tutorial. This is the folder where Android and IOS projects are created. You might encounter some platform specific problems during developement that will require these files but you should leave them intact most of the time. This folder contains Cordova plugins. When you initially create Ionic app some of the plugins will be installed. We will show you how to install Cordova plugins in some of our next chapters. This folder is used for adding resources like icon and splash screen to your project. 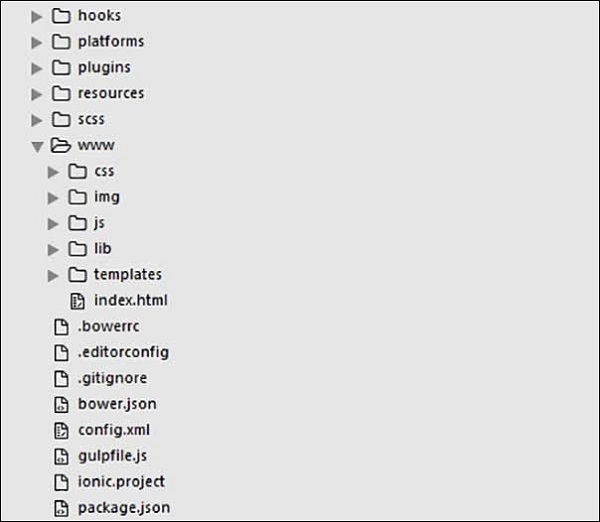 Since Ionic core is built with Sass this is the folder where your Sass file is located. For simplicity we will not use Sass for this tutorial. Our styling will be done using CSS. templates for your HTML files. Since this is beginners tutorial, we will just mention some of the other files and their purpose.